For your arrival, comfort and enjoyment. Check in time is 3 p.m. and we ask you to vacate the property by 10 a.m. on day of departure to enable us to service the cottages for the new arrivals. Each cottage has a fully fitted kitchen including microwave, electric cooker and hob, fridge with small freezer compartment, iron, plenty of pots and pans, cutlery, china and glassware. The Bathrooms have basin, bath with hand held shower attachment and toilet. Mill Cottage has 2nd bathroom with shower. There are showers in the indoor swimming pool changing rooms. Necessities such as tea-towels, washing-up liquid, J-cloth, toilet rolls. Electricity is all inclusive. Snooker lights, sauna and air hockey are coin operated you will need 50p, £1, £2 coins. Log fires are available in Riverside Cottage, Dairy Cottage and Waterfall Cottage. Log burners in Mill Cottage and Lakeside Cottage. Logs can be supplied at nominal charge. Courtyard Cottage has an electric log burner effect fire. TV digital freeview and DVD player. Towels, linen and duvets. Cots are only available in Mill Cottage, Riverside Cottage and Waterfall Cottage please bring your own cot bedding. There is an on-site laundry with a washing machine available free of charge and a tumble drier charged at £1 per load. Communal freezer for your frozen foods. Pets regrettable are not allowed. Book library, DVDs and board games. A comprehensive box of leaflets places to go and see and things to do. Weekly lets commence on a Saturday during peak period but can start on a Friday when available at all other times. 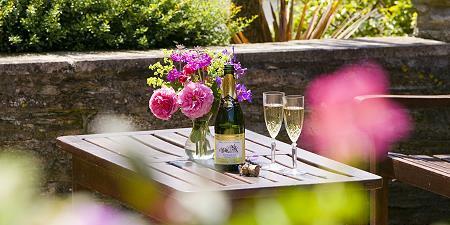 All cottages have garden furniture outside their cottages. BBQs can be used where safe to do so in the grounds or at our BBQ building by the pool (on request).